In Rangus mill different grains are milled. Wheat and rye are milled on a roll mill. By stone mill spelt and corn grains are milled. Common and Tatary buckwheat are milled on a special stone mill to ensure the highest possible quality. 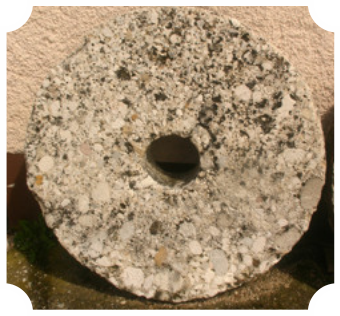 Milling with stones proceeds gently, without the exposure of milling products to too high temperature. 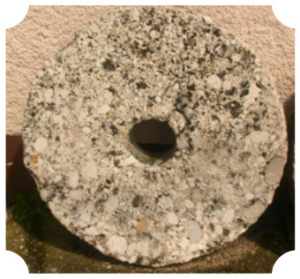 Millstones are made from natural materials (corundum, quartz, magnesium stones…). Flour particles have after milling on stones a large surface, this increases their ability for absorption of liquid. This ability ensures good airing and elasticity of dough. This characteristic influences positively the digestion, the organism is able to accept on the best possible way of natural content of vitamins, minerals and proteins from the flour. The traditional way of milling keep by low temperature of milling the vitamins, minerals and proteins undamaged. The natural content of nutrients allows making bread with excellent aroma. We dry buckwheat grain immediately after the harvest in special drying equipment. We clean buckwheat grain carefully and prepare it for processing. Quick and correctly dried buckwheat grains must have a beautiful shining surface. For preservation of quality of crops, especially buckwheat, it is very important, that we dry grains quickly to the humidity under 15 %. We keep excellent grain quality by quick drying immediately after the harvest. Rangus’s Slovenian buckwheat groats are carefully produced by traditional Slovenian technology. In mill Rangus in Dolenje Vrhpolje at Šentjernej, we are preparing buckwheat groats with a procedure of husking groats, traditional in Slovenia and known already for several centuries. By the cooperation with the specialists of Department of agronomy, Biotehnical Faculty, University of Ljubljana, we ensure the highest possible quality of crop milling products. It is harder to husk buckwheat grains in comparison to barley, because the inside part (endosperm) of buckwheat grain is brittle and the husk is very hard. Slovenian scientists from Biotehnical Faculty, Ljubljana, ten years ago, in cooperation with Swedish colleagues, found out, that traditionally husked Slovenian buckwheat groats has more slowly digestible starch in comparison to the industrial buckwheat milling products. Slowly digestible starch and indigestible starch from traditional Slovenian buckwheat groats are functionally similar to dietary fibre. Mill Rangus is using for husking high quality buckwheat crop, and in further producing of buckwheat groats, we monitor the quality of buckwheat very carefully from sowing to harvest and forward during quick drying procedure up to husking. Buckwheat groats have higher content of slowly digestible and resistant starch, this influences the slower appearance of sugar in the blood circulation after the digestion.